Full name is Miguel Odalis Tejada...married to Alejandra...has a daughter, Alexa, and a son, Miguel...Been active in community and charity events throughout his career...donated both his time and money to help hurricane victims in Dominican Republic in 2003 and 2004...Hosted Miguel Tejada Celebrity Showdown, a golf and fishing tournament, on December 7-11, 2006 in the Caribbean, benefitting Princess Margaret Hospital Foundation for Cancer Research...tournament was later broadcast in Dominican Republic and across seven different networks in North America in 2007...Assisted in an aid mission to Haiti following the January 2010 earthquake. Miguel was signed by the Orioles as a minor league free agent on May 8 and appeared in 36 games before being released on June 25...Played 34 regular season games for Aguilas in the Dominican Winter League...hit .284 with 9 doubles, 4 homers, 19 RBI and 20 runs scored, playing mostly second base...named a Caribbean World Series All-Star. 37-year-old big league veteran batted .239 (77-for-322) with 16 2Bs, 4 HRs and 26 RBI in 91 games for San Francisco before being designated for assignment on Aug. 31...his 91 games played were his fewest in season since his 1st year in Majors in 1997 with Oakland...his .239 clip was also his lowest since his rookie season in 1998 in Oakland when he batted .233...his 4 HRs and 26 RBI were also both career-lows...played 44 games at 3rd base (42 starts), 42 at shortstop (39 starts) and 4 at 2nd base (4 starts)...committed 10 errors, tied with Pablo Sandoval for most on club...batted 1st in lineup on April 2 at Los Angeles-NL, which was 5th time in his career to start game in leadoff slot and 1st time since July 28, 1999 at Minnesota while playing for Athletics...hit his 1st home run of year in Giants' home opener vs. Cardinals on April 8, hitting solo shot off RHP Jake Westbrook in 3rd inning to tie game at 1-1...became just 7th player in Giants history since 1958 to homer in his 1st at-bat in home opener...recorded 15th career game-ending hit vs. St. Louis on April 9 with walk-off 2-run 2B with 2 outs in 9th inning to give Giants 3-2 win...hit his 2nd HR of season in 9th inning of SF's 13-7 victory over Cubs at Wrigley Field in game 1 of doubleheader June 28...solo blast to left field was his 1st HR since April 8 - span of 225 at-bats, which marked longest span of ABs without HR in his career...hit his 12th career grand slam on July 2 at Detroit...made his 1st career start and appearance at 2nd base on July 5 vs. San Diego...was flawless in 6 total chances and turned 1 double-play...was placed on 15-day disabled list for just 3rd time in his career (1st since 2007) on July 19 with lower abdominal strain...suffered injury night before against Dodgers at AT&T Park while trying to field ground ball from Rafael Furcal...was reinstated off DL on Aug. 16, missing total of 25 games...was scheduled to begin rehab assignment that day for Double-A Richmond, but with several players going down with injuries, Giants had no choice but to activate him...appeared in 9 games with Giants after being reinstated from DL and was then designated for assignment, along with Aaron Rowand, on Aug. 31...cleared waivers and became free agent on Sept. 12. Split season between Orioles and Padres, combining for .269 average (171-for-636) with 15 HRs and 71 RBI ... Made his 5th Opening Day start for Orioles (also 2004-07 at shortstop) and his 1st at 3rd base ... Was acquired by San Diego in exchange for RHP Wynn Pelzer on July 29 ... Despite playing 59 games for San Diego and 97 for Baltimore, belted one more homer with Padres than with Orioles...averaged home run every 29.4 at-bats with SD (57.3 with BAL) ... Posted .730 OPS with Padres compared to .670 OPS with Orioles ... Appeared in his 2,000th career game Sept. 5 vs. Colorado ... Hit career HR number 300 on Sept. 22 at Los Angeles-NL off Ted Lilly ... Made 50 starts for Padres, including 57 at shortstop and 2 at third base...made 93 starts at third base for Orioles before trade...had never played position other than shortstop prior to 2010 season ... Reached base via hit, walk or hit by pitch in 47 of his 59 games with Padres ... Between 59 games with Padres and 18 Interleague games with Orioles, combined to hit .288 (90-for-313) with 10 2Bs, 9 HRs, 40 RBI and 41 runs scored in 77 games against National League opponents ... Finished season by hitting .308 (24-for-78) with 2 2Bs, 3 HRs, 14 RBI and 9 runs scored in his final 20 games beginning Sept. 13. Hit .283 (179x632) with 13 home runs and 66 RBI in 158 games...set Houston franchise records for a shortstop in a single season in hits (179), doubles (38) and games played (158)...is the first shortstop to lead the Astros in hits since Rafael Ramirez in 1978...hit .302 (71x235) with 16 doubles, three homers and 21 RBI in his last 57 games since July 26...ranked fifth among all NL shortstops in RBI (66) and home runs (13), third in runs scored (92) and hits (179), and tied for second in doubles (38)...his career-best .983 fielding percentage ranked second among National League shortstops...was the third-best, single-season fielding percentage by a shortstop in Astros history...the Astros were 51-26 when he scored at least one run and 25-10 in 2008 when he scored and drove in a run in the same game...hit safely in 75 percent of his games (119 of 158)...his grand slam on Sept. 10 was the first grand slam by an Astros shortstop since Adam Everett connected off of Danny Graves on July 9, 2003 vs. CIN...hit .295 (28x95) with 11 RBI in September...went 31 games without a home run from June 20 to July 28, tying his career-long streak without a homer from Aug. 22-Sept. 23, 2006...selected to his fifth All-Star Game and went 2x3 with a run, walk and stolen base in the American League's 15-inning 4-3 win at Yankee Stadium...his 10 home runs before the All-Star Break were tied for the most for a Houston shortstop in club history...his 44 RBI were the third-most in the first half for an Astros shortstop and the most since Denis Menke in 1970 (53)...scored the 1,000 run of his career on July 7 at PIT...became the third player in Astros history to hit a walk-off home run in his first home game with the team after hitting one on April 7 vs. STL...finished April hitting .339 (37x109) with four homers and 22 RBI...had consecutive four-hit games from April 21-22; the last Astro to record four-plus hits in consecutive games was Jeff Bagwell on July 14-15, 1995. Hit .296 (152x514) in 133 games during his fourth season with the Orioles in 2007...placed on the Disabled List on June 22 with a fractured left hand, snapping his consecutive games played streak at 1,152...the streak is the fifth longest streak of all-time and was longer than the next four active streaks combined when he went on the DL...was hit by a pitch from Doug Brocail in the eighth inning on June 20 at San Diego and left the game on June 21 at San Diego in the first inning...diagnosed with a fracture of the left radius, the forearm bone on the thumb side near the wrist...prior to June 23, last missed a game on May 31, 2000 with Oakland...played in his first 558 games after signing with the Orioles in 2004...passed Joe Sewell and Billy Williams on MLB's all-time consecutive games played list this season...hit 18 home runs on the season and has 253 in his career at shortstop, ranking fourth on the all-time home run list among shortstops...hit .382 (21x55) with runners in scoring position and two outs, sixth-best in the American League...hit .321 (86x268) in 68 games at Camden Yards and .268 (66x246) in 65 games on the road...grounded into a double play 22 times in 2007, tied with Orioles teammates Nick Markakis and Melvin Mora and Seattle's Kenji Johjima for second most in the league...had a 10-game hitting streak, April 14-25, during which he hit .395 (17x43)...homered on April 25 vs. Boston, his first home run since the season opener on April 2 at Minnesota...went 3-for-3 with an RBI, intentional walk and HBP on April 28 at Cleveland, reaching base in all five plate appearances...hit .337 (34x101) in April...hit a three-run home run on May 24 vs. Toronto, his first home run since April 25...went 100 at-bats without a homer, the second-longest drought of his career...missed nearly a month with the hand injury, returning to the lineup on July 27 vs. New York...hit .340 (97x285) in 72 games before going on the DL and .240 (55x229) in 61 games after his return...had a grand slam and five RBI on Aug. 9 vs. Seattle, his 10th grand slam and 250th career home run...had an 11-game hitting streak snapped on August 18 at Toronto...drove in runs in six consecutive games, Aug. 8-13, with 11 RBI total in that span...hit two solo homers on Aug. 28 vs. Tampa Bay, the Orioles' first multi-home run game of the season and the 12th of Tejada's career...was his fourth career pinch-hit appearance and first since Sept. 27, 2002 for Oakland at Texas...homered on Sept. 21 at Texas, his first since Aug. 31...hit a career-best 10 homers in August, the 20th time and 10th different player in club history to hit at least that many in a calendar month. Was named "Most Valuable Oriole" for the 2nd time in 3 seasons after leading the team with a .330 average, 24 home runs and 100 RBI...Set a club record and tied for 3rd in the American League with a career-high 214 hits, surpassing Cal Ripken's 211 hits in 1983...Was the 3rd time he has collected at least 200 hits in a season...His .330 batting average ranked 4th in the AL and was the 2nd highest mark in club history, behindMelvin Mora's .340 in 2004...Led the league with a .357 average at home and tied for 7th with 323 total bases...Finished 7th in the league with 56 multi-hit games, but was tied with Seattle's Ichiro Suzuki for the most 3-hit (22) and 4-hit (6) games in the majors...Had the 4th highest total of at-bats (648) and 6th most plate appearances (709) in the AL...Led the league with 28 GIDPs, but also came to the plate with the most GIDP situations (178) in the majors...Hit .329 vs. right-handers, 5th in the AL, and .335 vs. lefties, ranked 10th in league...Was the only player to finish in the top 10 in both categories...Played in all 162 games for the 6th straight season, extending his consecutive games streak to 1,080, longest active and the 7th longest streak of all-time...Was one of only 6 players to play in all 162 of his team's games in 2006...Last missed a game on 5/31/00 with Oakland...Since reaching the majors for good on 5/30/98, has started 1,374 of his team's 1,406 games at shortstop (97.7%) and has missed just 10 games total...Was named to the American League All-Star team for the 4th time in his career and 3rd straight season with the Orioles...Played the final 4 innings of the game and went 0-for-1...Had 21 home runs as a shortstop and 3 as designated hitter...Became the 3rd shortstop to hit at least 20 homers in 8 or more straight seasons, joining Cal Ripken (9, '83-'91) & Alex Rodriguez (8, '96-'03)...Has 237 career homers as a shortstop, 4th all-time behind Ripken (345), Rodriguez (344) and Ernie Banks (277)...Is the Orioles' all-time leader with a .315 batting average (minimum 1,200 at-bats)...Has a .516 slugging percentage in his 3 seasons with the Birds, the 3rd highest mark in club history...Is 3rd among all major league players with 1,330 hits over the last 7 seasons, starting in 2000, and 4th with 813 RBI...Had 43 hits in April, breaking Roberto Alomar's club record for hits in the opening month...Had a season-high 14-game hitting streak, April 15-29, batting .527 (29-55)...Named American League Player of the Week, April 17-23...Hit .536 (15-28) with 3 home runs, 10 RBI and 24 total bases during the week...Collected all 4 of the Orioles' hits on April 23 at New York...Was the first player to have at least 4 hits in a game while the rest of his team went hitless since the Cubs' Billy Williams on September 6, 1969...Had multi-hit games in 9 of 10 games, April 19-29, and drove in at least one run in 12 of 15 games, April 17-May 2...Went 1-for-4 on April 26 at Toronto, snapping string of 6 straight multi-hit and RBI games...Led the American League with a .422 batting average in April before hitting .224 in May...Tied for 5th in the league with 8 home runs in May...Batted over .300 in every month of the season except May...Hit 16 home runs in his first 66 games of the year through June 13...Hit 8 home runs over the final 96 games of the season...Snapped a career-long stretch of 120 consecutive at-bats without a home run by homering in consecutive plate appearances on September 24 vs. Minnesota...All 24 of his home runs came with zero or one man on base...According to the Elias Sports Bureau, no other player in the majors had as many homers, all with zero or one man on...Had 3 doubles on July 6 at Chicago, matching his career high for the 5th time...Had 34 doubles over his final 123 games after hitting 3 in the first 39 games...Hit safely in 130 of 162 games on the year...In addition to the season-high 14-game hitting streak in April, also hit safely in 13, 12, 11 and 9 consecutive games, and had a pair of 8-game streaks...Hit home runs in a season-high 3 straight games, May 13-15, and homered in consecutive games two other times...In his career, has homered in consecutive games a total of 32 times, including 6 times in which he has homered in 3 straight games and once in which he hit a home run in 4 consecutive games...Had 4 hits in a game 6 times on the season...Had 4 hits 3 times in a span of 7 games, July 22-29...Went 6-for-10 with 2 doubles and 3 RBI in a doubleheader against Philadelphia on June 28...Batted .419 (31-74) vs. New York...Had at least 2 hits in each of his first 8 games of the season against Yankees, the longest consecutive streak of multi-hit games against New York since Paul Molitor did it in 9 straight games in 1985...Made 12 starts at designated hitter and batted .313 with 3 home runs and 13 RBI...Started 5 straight games at DH, April 30-May 4, because of knee and hamstring soreness...Had made 2 previous career appearances at DH, both in 2005...Played for the Dominican Republic in the initial World Baseball Classic, going 7-24 (.292) with 3 doubles, 3 RBI in 6 games. Earned his second straight Silver Slugger Award as the top offensive shortstop in the American League after recording 26 home runs and 98 RBI...Led the AL with 50 doubles, matching Brian Roberts' club record set in 2004...Also finished 4th in the AL with 199 hits and 10th with a .304 batting average...Played in all 162 games for the 5th straight season, running his consecutive games streak to 918, the 7th-longest streak of all time...Started 160 games at shortstop and made 2 starts as designated hitter, his first career appearances there...Started at DH on 8/21 at Cleveland and 9/14 at Texas, going a combined 1-for-9...Was named to his 3rd All-Star Game, first as a startter, and was named the game's Most Valuable Player, going 1-for-3 with a home run and 2 RBI in the game at Detroit...Marked the 6th time an Oriole has won the All-Star MVP award, the most by any club since it was first given in 1962...The Giants and Dodgers have won it 5 times each...Set a club record with 31 RBI in April, topping Mike Bordick's 2000 record of 29...Led the majors in RBI at the end of the month but then had 67 RBI in 139 games the remainder of the season...Had only 4 multi-RBI games after 6/23...Drove in at least one run in 9 straight games, 4/8-17, one shy of the Orioles club record held by Doug DeCinces (9/22-10/1, 1978) and Reggie Jackson (7/11-7/23, 1976)...Homered in a career-high 4 straight games, 4/26-5/1...Had homered in 3 straight games six previous times in his career...Hit his 200th career home run on 5/9 vs. Minnesota to become only the 5th player to hit 200 or more home runs as a shortstop...Hit 19 home runs in 67 games through 6/18...Hit 3 home runs over his next 56 games and only 7 homers the rest of the season...Had a season-high 12-game hitting streak, 6/21-7/3, batting .362 (17-47)...Also had an 11-game hitting streak, 5/7-18...Went 5-for-5 with 2 doubles and a triple on 7/9 vs. Boston, his 2nd career 5-hit game...Had 4 other games with 4 hits each, including 6/1 at Boston, when he homered and matched his career high with 3 doubles...Hit safely in 69 of 87 games in the first half, leading the AL with a .604 slugging percentage, and was 5th with a .329 batting average at the break...Batted .276 in the second half and hit safely in 124 of 162 games on the season...Hit 2 home runs and had a season-high 5 RBI on 8/23 against Los Angeles...Hit his 9th career grand slam off Francisco Rodriguez in the game...Also connected on a grand slam on 4/17 off New York's Kevin Brown...Went just 4-for-19 with the bases loaded but had 2 grand slams and 14 RBI...Has batted .279 (41-147) with 9 homers and 132 RBI with the bases loaded in his career...Went consecutive games without a hit only 5 times during the year...Went hitless in a season-high 3 straight games, 9/11-13...Had 98 RBI, two short of his 6th straight 100-RBI season. Was named "Most Valuable Oriole" after batting .311, leading the team with 34 home runs and setting a club record with 150 RBI while playing in every game in his first season with the O's...Led all major league players in RBI...Ranked among American League leaders in go-ahead RBI (1st, 36), game-winning RBI (T1st, 19), total bases (3rd, 349), extra-base hits (4th, 76), home runs (8th, 34) and doubles (9th, 40)...Was 4th in the American League with 203 hits...Was the 4th player (5th time) in club history to have 200 hits in a season. Finished 5th in AL MVP voting by the Baseball Writers Association of America, the highest finish by an Oriole since Randy Myers was 4th in 1997...Won his first AL Silver Slugger Award as the top offensive shortstop in the league, as voted by the league's managers and coaches...Led the American League with 14 sac flies, the 2nd-highest total in club history behind Bobby Bonilla's 17 in 1996...Bonilla's total is tied for the most in the AL beginning in 1954...Has 190 career homers, all at shortstop...Is 7th on the all-time home run list as a shortstop, two behind Jose Valentin and four behind Barry Larkin...Played in all 162 games for the 4th straight season, running his consecutive games streak to 756...It is the longest active streak in the majors, the 11th longest of all-time, and the longest in the majors since Cal Ripken's 2,632-game streak began in 1982...Last missed a game on 5/31/00 with Oakland...Since reaching the majors for good on 5/30/98, has started 1,064 of his team's 1,082 games at shortstop (98.3%) and has missed just 10 games...Played all but 32 innings last season, leaving 16 games early...Has missed a total of 114 innings over the last 4 seasons...Hit safely in 123 games on the season and was 5th in the American League with 58 multi-hit games...Went 3 games without a hit, August 23-25, his longest consecutive hitless streak of the season...Won the All-Star Home Run Derby in Houston, setting records for homers in a round (15) and overall (27)...Was the 2nd Oriole to win the derby, joining Cal Ripken in 1991...Played the final 3 innings of the All-Star Game, going 0-for-1 in his 2nd appearance in the Midsummer Classic...Was named American League Player of the Week twice during the season and has won the award four times in his career...Shared the honor with Boston's Kevin Millar, July 19-25, after batting .424 (14-33) with 4 HR and leading the league with 14 RBI and 11 runs scored during the week...Was named Player of the Week for a second time, September 20-26, batting .483 (14-29) with 3 HR and leading the league with 11 RBI, a .862 slugging pct. and 25 total bases...Batted just .118 (2-17) with 14 RBI with the bases loaded, the lowest mark of his career...Has batted .289 (37-128) with 7 homers and 18 RBI with bases loaded in his career...Hit his first home run as an Oriole to lead off the 11th inning on April 15 at Boston, leading to a 5-run inning and a 12-7 win...Had 4 hits, including a game-winning 3-run home run in the bottom of the 9th, on September 24 vs. Detroit...Was his 4th career game-ending home run...Homered in 3 straight games, May 27-29, the 6th time in his career he has done so...Drove in at least one run in 5 straight games, April 22-27...Had two 2-home run games on the season...Hit a pair of game-tying 2-run home runs in a 12-11 win vs. Cleveland on May 9...Also had 2 homers on September 18 at Minnesota...Had 4 hitting streaks of 10 or more games, including a season-high 19-game streak, June 15-July 4, when he batted .397 (31-78) with 6 HR and 20 RBI...Collected his 1,000th career hit with a single in the 4th inning on May 4 versus Chicago...Matched his career-high with 3 walks on June 4 vs. Tampa Bay, the 4th time he had done it and first since 2001...Had a season-high 4 hits three times on the season - April 18 at Toronto, August 22 versus Toronto and September 24 against Detroit...Was one of 6 finalists for the American League's Hank Aaron Award, recognizing the best offensive performer in each league...Was named "Favorite New Oriole" for 2004 by the Oriole Advocates, a non-profit volunteer group that promotes baseball in the region...Led all American League shortstops with 5.15 total chances per 9 innings...Committed a career-high 24 errors, 3rd most among AL shortstops...Tied with New York's Jorge Posada for the American League lead with 24 grounded into double plays, which also tied for the 7th highest single season total in club history...Before joining the Orioles in spring training, played in 4 games for Aguilas in the Dominican Winter League, then helped the Dominican Republic win the Carribean World Series in for first time on their native soil...Also played briefly for Aguilas and then for the Dominican team in the Carribean World Series after the season. Overcame a slow start to finish with a .278 batting average, 27 home runs and 106 RBI...batted just .176 (23 for 131) over his first 32 games but then hit .305 (154 for 505) over his final 130 games starting on May 7...led the A's in games (162), at bats (636), runs (98), hits (177), doubles (42) and RBI and tied for the team lead in stolen bases (10)...tied for 10th in the American League in RBI and drove in 100 runs for the fourth consecutive season to become fifth player in Athletics history with at least four straight 100 RBI seasons...joins Al Simmons (1924-32), Bob Johnson (1935-41), Jimmie Foxx (1929-35) and Jason Giambi (1998-01)...tied for eighth in the A.L. with a career high 42 doubles...that was the third best total in Oakland history behind Giambi (47 in 2001) and Eric Chavez (43 in 2001)...had his streak of three straight 30 homer seasons come to an end as he finished with 27...now has 156 career home runs which is tied for ninth with Joe Cronin on baseball's all-time list for home runs as a shortstop...ranked second among major league shortstops in RBI (Alex Rodriguez, 116) and fourth in home runs...his final .278 batting average was the highest it was all season and it was the second best mark of his career to his .308 last year...appeared in all 162 games for the third consecutive season and now has a consecutive games played streak of 594...that is an Athletics record, the longest active streak in the majors and the 20th longest streak in major league history...last missed a game on May 31, 2000...the A's have a record of 365-229 (.614) during the streak...played in all but 11 innings over the A's first 158 games but then missed 13 innings over the A's final four games after clinching the division...has now missed a total 82 innings over the last three years...since joining the A's for good on May 30, 1998 he has started 902 of the A's 920 at shortstop and has missed just 10 games...has now played 935 games in his career at shortstop which is third most in franchise history (Bert Campaneris 1702, Chick Galloway 971)...struck out a career low 65 times and averaged one strikeout per 10.8 plate appearances which was the sixth best mark in the AL...was averaging one strikeout per 6.8 plate appearances in his career entering the season...tied for eighth in the A.L. with 636 at bats, the fourth best single season total in Oakland history...ranks seventh on the Oakland career list in home runs (156) and RBI (604), eight in extra base hits (358), ninth in doubles (191) and slugging percentage (.460) and 10th in runs scored (574)...has 83 career home runs in Oakland which ranks sixth on the Network Associates Coliseum all-time home run list...finished second among major league shortstops with 751 total chances to Kansas City's Angel Berroa (760) but topped the majors with 490 assists...committed 21 errors which equals the second highest total of his career and ranked third most in the majors behind Atlanta's Rafael Furcal (31) and Berroa (24)...made 10 errors in his first 33 games, three over his next 80 and eight in his final 49...batted .303 (97 for 320) on the road compared to .253 (80 for 316) in Oakland...now has a .283 (515 for 1819) career average on the road compared to .257 (453 for 1765) in Oakland...hit .406 (26 for 64) on turf and now has a .306 (114 for 373) career average on turf...was 5 for 17 (.294) with two grand slams with the bases loaded and is now a .315 (35 for 111) career hitter with the bases loaded with seven grand slams...is tied for fourth on the Oakland career grand slam list...batted .321 (98 for 305) in 80 starts batting fourth and .239 (78 for 327) in 81 starts hitting third...had 45 multiple hit games, including four games of four or more hits which tied for second most in the AL...led the A's with 27 multiple RBI games...had 26 go-ahead RBI which tied for ninth in the AL...the A's went 22-4 (.846) in games in which he homered and are 116-31 (.789) when he homers in his career...15 of his home runs came with men on base (8 two-run, 5 three-run, 2 slams) and 84 of his 156 career home runs have come with men on base (50 two-run, 27 three-run, 7 slams)...12 of his 27 home runs either tied the game or put the A's ahead...hit .161 in April but then batted at least .288 in each of the final five months of the season...hit .295 in May, .288 in both June and July, .327 in August and .319 in September...his April batting average marked the third time he has hit under .200 in his career (.168 in July, 1999 and .190 in September, 1997)...his August batting average was his best in a month since hitting .329 in September of 2001...hit .245 (92 for 375) with 15 HR and 56 RBI in 93 games before the All-Star Break and .326 (85 for 261) with 12 HR and 50 RBI in 69 games after the break...now has a .325 (183 for 563) average after the All-Star Break over the last two seasons...hit his second career game ending home run on April 22 against Detroit...had his first of three 11-game hitting streaks from May 20 to 31 (14 for 43, .326)...had a total of four hitting streaks of 10 or more games...had a career high 32-game errorless streak from May 8 to June 13, the longest by an A's shortstop since Rafael Bournigal had a 41-game streak from September 21, 1997 to September 18, 1998...played in his 500th consecutive game on June 17 against Texas to become the 32nd player (34th time) in major league history to reach 500 (Alex Rodriguez later became the 33rd)...tied an Oakland record with his first career five-hit game on June 19 against Texas...homered five times and had 14 RBI over a 10-game span from June 17 to 26 but then had a 26-game, 107-at bat homerless streak before his next home run on July 27 at Anaheim...that equaled the longest one-season homerless streak of his career (third time) although he had a 28-game streak from September 26, 1998 to May 3, 1999...had a career best 12-game, 53-plate appearance stretch without a strikeout from June 29 to July 13...hit safely in each of his first 11 games after the All-Star Break (16 for 43, .372) after hitting safely in his first 24 games after the break last year...hit his third career game-ending home run in the 10th inning on August 1 against New York and then delivered the game-ending two-run double against Yankees on August 3...had six straight multiple hit games from August 20 to 25 (15 for 27, .556) with five doubles, four home runs and 10 RBI...was named A.L. Co-Player of the Week for the week of August 18 after hitting .462 with three home runs and eight RBI...it was the second time he won the award...hit his first grand slam on August 24 at Toronto and it was one of an Athletics record two slams in the game...other slam came on September 15 at Anaheim, his final home run of the season...had his lone two homer game of the season on August 27 against Baltimore, the seventh multi-homer game of his career...had his third 11-game hitting streak from September 9 to 20 (16 for 42, .381)...hit .433 (13 for 30) against Toronto and .365 (27 for 74) with six home runs and 19 RBI in 19 games against Texas...now has a .312 (112 for 359) career average against the Rangers, his best mark against any A.L. team...his 19 HR and 80 RBI in his career against Texas are his most against any team...went 11 for 18 (.611) in SkyDome and is a .340 (34 for 100) career hitter there with 12 HR and 33 RBI in 26 games. Was named American League Most Valuable Player by the Baseball Writers Association of America following his finest season to date...became the seventh Oakland player to win the award joining Vida Blue (1971), Reggie Jackson (1973), Jose Canseco (1988), Rickey Henderson (1990), Dennis Eckersley (1992) and Jason Giambi (2000)...was also one of two A's named to the A.L. All-Star team...established career highs in batting (.308), at bats (662), runs (108), hits (204), home runs (34), RBI (131), total bases (336), on-base percentage (.354) and slugging (.508)...ranked ninth in the A.L. in batting, tied for seventh in home runs and third in RBI...tied for third in hits as he became the first Athletic in 65 years to collect 200 hits in a season (Wally Moses, 208 with Philadelphia in 1937)...the 204 hits broke Jose Canseco's Oakland record of 187 in 1988 and tied for the ninth best single season total in Athletics franchise history...broke his own franchise records for home runs and RBI by a shortstop, topping his 31 home runs in 2001 and his 115 RBI from 2000...his home run and RBI total ranked second among major league shortstops to Alex Rodriguez (57 HR, 142 RBI) and his .309 batting average in games as a shortstop was second only to Garciaparra (.312)...joins Alex Rodriguez (six times) and Ernie Banks (four times) as the only shortstops in major league history with three or more 30 home run seasons...now has 129 career home runs, an Athletics franchise record for a shortstop...ranks ninth on the Oakland career home run list...68 of his home runs have come in Oakland which ranks seventh on the Network Associates Coliseum career home run list...his 131 RBI were the second best single season total in Oakland history to Jason Giambi's record of 137 in 2000...now has three straight 30 homer seasons, three straight 100 RBI seasons and scored 108 runs to give him three straight seasons with 100 or more runs...is one of six players in Athletics history with 30 home runs in three straight seasons (Canseco, Foxx, Giambi, Kingman, McGwire), one of eight with 100 RBI in three consecutive seasons (Baker, Canseco, Foxx, Giambi, Johnson, Simmons, Zernial) and one of eight with 100 runs in three straight seasons (Bishop, Collins, Foxx, Giambi, Henderson, Johnson, Simmons)...his .308 batting average tied for the eighth best single season total in Oakland history...was fifth in the A.L. in total bases (336), the fourth best single season total in Oakland history...finished second in the A.L. with 662 at bats, breaking the Oakland record of 644 set by Johnny Damon in 2001...those were second most at bats in Athletics history to Al Simmons record 670 in 1932...tied for second in the A.L. with 32 go-ahead RBI and had three "walk-off" hits, all in September...batted .265 (86 for 325) with 18 home runs and 50 RBI with two strikes...led the A.L. in two strike hits, ranked tied for second in RBI and was third in batting and home runs...his 86 two-strike hits tied for the sixth best single season total in baseball since 1988...ranked third in the A.L. with a .375 average with runners in scoring position, the best such mark by an Athletic since Rickey Henderson hit .419 in 1995...also ranked among the A.L. leaders in grounded into double plays (t-2nd, 21), average with RISP and two outs (4th, .373), road batting average (5th, .336), multiple hit games (t-6th, 57), hit by pitches (t-9th, 11) and runs scored (10th, 108)...was 9 for 22 (.409) with the bases loaded and now has a .319 (30 for 94) career average with the bases loaded...led the A's in batting, at bats, runs, hits, total bases, RBI and hit by pitches and tied for the team lead in home runs...played in all 162 games for the second consecutive season and now has a consecutive games played streak of 432 which is an Oakland record and the longest active streak in baseball...played in all but nine innings over the first 159 games and then missed 17 innings over the final three games after the A's clinched the West...has now missed a total of 58 innings over the last two seasons...since joining the A's for good on May 30, 1998, he has started 740 of the A's 758 games at shortstop and has missed just 10 games...has now played 773 games at shortstop, second most in Oakland history to Bert Campaneris (1272)...was batting .294 with 15 HR and 59 RBI in 88 games before the break but improved upon all those numbers in the second half, hitting .325 with 19 home runs and 72 RBI in 74 games...led the majors in RBI after the break...split his playing time between the fifth and sixth spot in the batting order over the first 42 games...moved to the three spot on May 19 at Toronto and started 119 of the A's last 120 games there, hitting .314 (155 for 493) with 28 home runs and 108 RBI...19 of his 34 home runs came with men on base (12 two-run, seven three-run) and 69 of his 129 career home runs have come with men on base (42 two-run, 22 three-run, 5 slams)...13 of his home runs gave the A's the lead and four tied the game...the A's were 24-8 in games in which he homered and are 94-27 (.777) in his career when he homers...committed 19 errors which tied for second most among A.L. shortstops but was the lowest total of his five full seasons in the majors...had a career high .975 fielding percentage but that ranked fourth lowest among A.L. shortstops...led A.L. shortstops in assists (504) and total chances (752) and was third in double plays (106)...broke his own Athletics record for assists by a shortstop, topping his 501 from 2000...had a 15-game hitting streak from April 17 to May 3 (22 for 61, .361), his first of four hitting streaks of 10 or more games in 2002...hit safely in 13 straight from May 21 to June 3 (22 for 61, .361), 11 straight from June 26 to July 6 (13 for 44, .295) and 24 straight from July 11 to August 4 (34 for 102, .333)...the 24-game streak was a career high, the longest ever by an Athletics shortstop, the longest in the A.L. in 2002 and the second longest in Oakland history, one short of Jason Giambi's 25 in 1997...joins Giambi as the only Oakland hitters with two hitting streaks of 15 or more games in the same season (Giambi had 17 and 16 in 1998)...hit safely in 35 of 36 games from June 26 to August 4 and hit safely in 130 games for the season...went consecutive games without a hit just four times all year, including a season high three straight games from April 13-16...hit his 100th career home run on April 25 against New York and homered in all three games of the Yankee series, April 23-25...equaled his career high with four hits on May 31 at Tampa Bay and September 26 at Seattle...has five career four-hit games, two against Seattle...broke Alfredo Griffin's Oakland record of 347 consecutive games played on June 27 at Seattle...committed a career high tying three errors on June 28 against San Francisco (also June 19, 1998 at Seattle)...finished June with 29 RBI which led the majors and was the second best one month total of his career (34 in August, 1999)...became the first A's shortstop to be named to the American League All-Star team since Bert Campaneris in 1975...went 1 for 2 with a run scored and played innings five through eight at shortstop in the Mid-Summer Classic...drove in at least one run in 13 of the A's first 14 games after the break, collecting seven home runs and 18 RBI over that span...then had an A's season high six RBI on July 28 at Texas, the second best one-game total of his career...had eight RBI on June 30, 2001 at Texas...hit his 117th career home run on July 24 at Anaheim, breaking Eddie Joost's Athletics franchise record for shortstops...hit .322 in August, his best one month batting average of the season...had his first two homer game of the season on September 1 against Minnesota...his second home run of the game was a three-run "walk-off" blast in the bottom of the ninth, giving the A's a 7-5 victory and extending their winning streak to 18 games...added the game-ending single the next day against the Twins and had his third "walk-off" hit of the season on September 16 against Anaheim, a RBI single...reached the 200 hit plateau in dramatic fashion as he stepped to the plate with the A's trailing 2-1 with one out in the ninth inning on September 26 at Seattle and hit his 32nd home run of the season, establishing a new career high and tying the game...the A's would go on to win the game in 10 innings and clinch the A.L. West...homered twice at Texas on September 28, his sixth career multi-homer game, his second against the Rangers...now has 13 career home runs against the Rangers, equaling his most against any team (Anaheim and Toronto)...his 61 RBI against Texas are his most against any club...posted his best batting averages against Minnesota (.412), Detroit (.407) and New York (.395)...his .303 career batting average against the Twins is his best against any A.L. team...was 3 for 21 with a home run and four RBI in five post-season games against Minnesota...has started all 15 games at shortstop in post-season play for the A's over the last three years...appeared in five games for Aguilas in the Dominican Winter League and was 5 for 21 (.238) with two home runs and five RBI. Broke his own Athletics franchise (1901-2001) record for home runs by a shortstop and fell just short of his RBI record...had 31 home runs and 113 RBI after tallying 30 home runs and 115 RBI in 2000...now has two of the 20 30-homer seasons by shortstops in major league history...joins Alex Rodriguez (5 times), Ernie Banks (4), Nomar Garciaparra (2) and Vern Stephens (2) as the only shortstops with more than one 30-homer season...ranked third among major league shortstops in home runs in 2001 (Rodriguez 52, Aurilia 36) and was second in RBI (Rodriguez 135)...has 95 career home runs, an Oakland record for shortstops and second only in franchise history to Eddie Joost (116)...in addition to home runs, he also had career highs in at bats (622), runs (107) and stolen bases (11)...also played in all 162 games, starting 160 of those at shortstop...joins teammate Terrence Long as the first Oakland players to play in 162 games since Alfredo Griffin in 1986...is one of six players in Oakland history to play in every game in a season (eight times)...has now played in 270 consecutive games which is the second longest consecutive games played streak in Oakland history behind Griffin (347)...played in all but 32 innings in 2001...has missed just four games over the last three years and since joining the A's for good on May 30, 1998 he has started 579 of the A's 596 games at shortstop and has missed just 10 games...tied for the American League lead in games played, ranked eighth in runs (107) and was 10th in at bats (622)...the at bat total was the eighth best single season total in Oakland history...was 9 for 22 (.409) with the bases loaded and connected for three grand slams...is the eighth player (ninth time) in franchise history to hit at least three grand slams in a season...15 of his 31 home runs came with men on base (7 two-run, 5 three-run and 3 slams) and 50 of his 95 career home runs have come with runners on (30 two-run, 15 three-run, 5 slams)...A's were 23-5 in games in which he homered and Oakland is now 62-14 when he homers over the last three years...batted .305 (50 for 164) with runners in scoring position...had his most starts batting in the six spot (65) but hit just .234 (58 for 248) batting sixth...hit .318 (21 for 66) when batting second, .306 (44 for 144) when batting fifth and .303 (37 for 122) when batting seventh...committed 20 errors which was second most among A.L. shortstops to Minnesota's Cristian Guzman (21)...however, his 20 errors were the fewest of his four full major league seasons...his .973 fielding percentage was fourth lowest among A.L. shortstops...ranked second in assists (256), tied for second in total chances (749) and fourth in double plays (93)...hit the 10,000th home run in Athletics history on April 14 against Texas, a solo shot in the seventh inning off Kenny Rogers...finished April with a .237 batting average but then hit .295 with eight home runs and 25 RBI in 27 games in May...homered twice against Toronto on May 2 and then homered in each game of a three-game series at Toronto, May 8-10...that gave him a streak of six consecutive games with a home run at SkyDome dating back to 2000...it was the third time in his career he homered in three consecutive games...had a season long 0 for 15 streak from June 7 to 10...committed two errors on June 17 at San Francisco, his first two error game since August 23, 1999...had gone homerless in 26 consecutive games (102 at bats) when he had the second three-homer game of his career on June 30 at Texas...had a grand slam in the first inning, a three-run homer in the second inning and a solo home run in the ninth inning for a career high eight RBI...it was the 13th three homer game by a shortstop in major league history and he and Ernie Banks are the only shortstops with two three-homer games...is the fourth Athletic with two three-homer games (Berroa, Foxx and McGwire)...the eight RBI were the most by an A's player since Dave Kingman also had eight on April 16, 1984 at Seattle...also walked in that game against Texas, snapping a streak of 29 games and 116 plate appearances without a walk...had a career high tying 29-game errorless streak from June 22 to July 24...hit .192 (24 for 125) over a 33-game stretch from August 3 to September 7...including .216 in August, his lowest average in a month since hitting .168 in July, 1999...then batted .438 (21 for 48) during a career high tying 13-game hitting streak from September 8 to 29...drove in at least one run during the first eight games of the streak, falling two short of Rick Monday's Oakland record of 10 consecutive games with an RBI...had four home runs, 19 RBI and 15 runs scored during the hitting streak...capped the streak in grand style when he hit for the cycle on September 29 at Seattle...it was the fourth cycle in Oakland history, the 15th in Athletics history and the 22nd in major league history by a shortstop...became the third Athletic (Nap Lajoie and Jimmie Foxx) and sixth major leaguer (Bill Terry, Tony Lazzeri, Jay Buhner) to hit a grand slam while hitting for the cycle...the cycle was one of his two four-hit games in 2001 and he now has three four-hit games in his career...batted second when he hit for the cycle and started seven of the A's final eight games in the two spot (11 for 28, .393) with three home runs and 10 RBI...had 26 RBI over his final 23 games...hit .286 with three doubles in the ALDS against New York...including a 4 for 5 performance in Game 4...batted .365 with seven home runs and 22 RBI in 19 games against Texas, all his best figures against any club in 2001...added six home runs against Toronto and now has 13 career home runs against the Blue Jays, his most against any club...hit .269 with a home run and nine RBI for Aguilas in the Dominican Winter League. Set Athletics franchise (1901-2000) records for shortstops with 30 home runs and 115 RBI ... broke Eddie Joost's record of 23 home runs set in 1949 and Eric McNair's record of 95 RBI in 1932 ... now has 64 career home runs, an Oakland record for shortstops and third most in franchise history behind Joost (116) and Bert Campaneris (68) ... became just the ninth shortstop (17th time) in major league history to hit 30 home runs ... posted the 52nd 100 RBI season by a major league shortstop ... ranked second among major league shortstops in 2000 to the Mariners Alex Rodriguez in home runs (41) and RBI (132) ... led all American League shortstops in total chances (755) and assists (501) and ranked fourth in double plays (115) ... was seventh with a ... 972 fielding percentage, committing 21 errors ... however, had a career best 29 game errorless streak from August 28 to September 28 and made just two errors in his last 49 games ... appeared in a career high 160 games, the most by an A's player since Alfredo Griffin played all 162 games in 1986 ... has missed just four games over the last two years and since joining the A's for good on May 30, 1998 he has started 419 of the A's 434 games at shortstop and has missed just 10 games ... also had career highs in batting (.275), runs (105), hits (167) and walks (66) ... his average was a 24 point improvement over his .251 from last year which was an 18 point improvement from his .233 during his rookie season of 1998 ... started slowly as he was hitting .239 (56 for 234) with nine home runs and 41 RBI over his first 60 games ... then hit .298 (111 for 373) over his final 100 games with 21 home runs and 74 RBI ... his first home run of the season was the first grand slam of his career on April 19 at Cleveland ... matched his career high with five RBI.16 of his home runs came with men on base (10 two-run, four three-run, two slams) and 35 of his 64 career home runs have come with runners on (23 two-run, 10 three-run, one slam) ... his second home run on April 30 at Minnesota gave the A's the lead ... that started a stretch where each of his eight home runs through June 5 either tied the game or put the A's ahead ... for the season, 12 of his home runs either tied the game or put the A's ahead ... A's posted a 22-7 record in games in which he homered in 2000 and are 39-9 when he homers over the last two years ... had his first career four-hit game on May 3 at Kansas City as part of a four-game stretch where he was 11 for 20 with four doubles, a home run and nine RBI ... had a 10-game hitting streak from June 11 to 21 (16 for 43, .372) which was a career high until he hit safely in 13 straight from July 29 to August 12 (19 for 46, .413) ... had his second career multi-homer game when he homered twice against Arizona on July 8 ... both of his multi-homer games have come in interleague play (3 vs ... Los Angeles on June 11, 1999) ... had six home runs and 14 RBI in 18 interleague games in 2000 and now has 11 home runs and 29 RBI in his interleague career ... hit his 53rd career home run on July 27 against Boston to break Bert Campaneris' Oakland career record for shortstops ... hit his 20th home run on July 31 against Toronto, joining Eddie Joost (23 in 1949 and 20 in 1952) as one of two Athletics shortstops with two 20 homer seasons ... finished July with a .305 batting average, the first time he hit .300 in a month in his career ... added eight home runs and 23 RBI in 27 games ... hit just one home run in August but then homered in three consecutive games at Toronto, September 2-4, to snap a 20-game, 74 at bat homerless streak ... final home run of the season was his second career grand slam on September 30 against Texas and he matched his career high with five RBI ... finished September with nine home runs, which tied for third most in the American League in the month ... batted .296 (130 for 439) against right handed pitchers with 20 of his 10 home runs compared to .220 (37 for 168) against left handed pitchers.20 of his 30 home runs in 2000 came at night and 48 of his 64 career home runs have come under the lights ... batted .325 (38 for 117) in the number two spot and made the first two starts of his career in the clean-up spot on September 21 and 24 at Seattle ... had four home runs and 15 RBI against the Royals and now has eight home runs and 32 RBI against Kansas City in his career, both his best figures against any club. Set an Oakland record for RBI by a shortstop and fell one short of the mark for home runs ... His 84 RBI topped the mark of 64 set by Bert Campaneris in 1970 and matched by Alfredo Griffin in 1985 ... With 21 home runs, he became just the second shortstop in Oakland history and third in franchise history to hit 20 home runs ... Has 34 career home runs in two plus seasons which is second in Oakland history among shortstops to Campaneris (52) and fifth in franchise history ... He made the home runs count also as 10 gave the A's the lead in 1999 ... The A's were 17-2 in games in which he homered ... Got off to a fast start as he hit a team leading .406 during spring training and then went 15 for 40 (.375) over his first 12 games ... That included an Oakland record tying three doubles on April 10 at Seattle ... Hit .284 in April but did not homer ... Hit his first home run on May 4 at Toronto after 26 games and 96 at bats ... Average had dropped to the .253 mark before he was moved to the number two spot in the order on May 28 ... Hit safely in 11 of his first 13 games when batting second (19 for 54, .352) and capped that stretch by hitting an Oakland record tying three home runs against Los Angeles on June 11 ... It was the 11th three-homer game by an Oakland player, the 23rd by an Athletic and the first by a shortstop ... He became just the 10th shortstop in Major League history to hit three homers in a game ... Had a career high five RBI in that game ... Then went into a slump where he hit just .194 (31 for 160) with one HR and 16 RBI over a 40-game stretch ... Did not take his offensive woes to the field as he had a career best 26-game errorless streak from June 15-July 16 ... Added a 21-game streak from July 27-August 18 and finished the season with a .973 (21 errors in 784 chances) fielding percentage after fielding .951 in his rookie campaign of 1998 ... Ranked seventh among American League shortstops in percentage but was second in assists (471) and total chances (783) and third in double plays (110) ... Snapped a 98 at bat homerless streak on July 30 against Tampa Bay and then hit .288 in August with 9 HR and 34 RBI ... Had just 9 HR and 39 RBI in 101 games entering the month ... The average was his best ever in a full month and the RBI total was fourth highest ever in a month by an Oakland player ... Was second in the majors in RBI in August ... Began August by homering in three straight games, including back to back four RBI games on August 2-3 ... Was named American League Co-Player of the Week along with Wade Boggs for the week of August 2-8 ... Tied for the A.L. lead with a .500 batting average during the week and led the league with 24 total bases, four doubles and eight walks ... Reached base in 10 straight plate appearances, August 28-30 and his seven consecutive hits over that span fell one short of the Oakland record ... Then had a 0 for 22 streak from September 3-10 to tie the longest hitless streak of his career ... Had a career high nine game hitting streak from September 13-23 (14 for 35, .400) ... Finished the year with a three-hit game against Seattle and was second on the club with 38 multiple hit games ... Hit .272 (79 for 290) at home but his .231 (70 for 303) road batting average was second lowest in the American League ... Hit .197 (37 for 188) after the sixth inning which ranked third lowest in the league ... 17 of his 21 home runs came off right handed pitching ... Posted his best numbers against the White Sox, hitting .441 (15 for 34) with six doubles, 10 walks and 14 RBI in 10 games ... Hit .308 with a home run and 13 RBI in 32 games for Aguilas in the Dominican Winter League. Was one of four rookies to start at least 100 games for the A's in 1998 ... Rated as the 10th best prospect in baseball by Baseball America entering the season ... Recalled from Huntsville on May 30 and started 104 of the A's final 111 games at shortstop ... Hit 11 home runs which at the time was second most by an Oakland shortstop to Bert Campaneris' 22 in 1970 ... Tied for fifth among American League rookies in home runs and doubles (20) and also ranked fourth in extra base hits (32) and fifth in runs scored (53) ... Opened the season on the disabled list as he fractured his right middle finger on March 21 ... Was on a rehab assignment at Huntsville when he was activated from the disabled list and optioned to Huntsville on May 20 ... Had a .327 batting average with two home runs and seven RBI in 15 games with the Stars when the A's called 10 days later ... Started each of his first 51 games at shortstop and played in all but four innings before getting his first day off on July 26 ... Homered in consecutive games July 2-3 and 27-28 ... Did not have any prolonged hitless streaks as he never went more than three games without a hit ... Fared better on the road where he batted .261 compared to .204 in Oakland ... Struggled defensively, committing 20 errors in his first 63 games, including 11 in a 25-game span from July 12-August 8 ... Then made six errors in his final 42 games, including an 18-game errorless streak from August 21-September 12 ... Finished the season with 26 errors which was second most among American League shortstops to Mike Caruso of the White Sox (35) ... The 26 errors were the most by an A's shortstop since Alfredo Griffin committed 30 in 1985 and nine short of the Oakland record set by Bert Campaneris who made 34 errors in 1968 ... Hit .267 for Aguilas in the Dominican Winter League. Made his Major League debut at the age of 21 ... Spent most of the campaign at Double-A Huntsville and was named to the Southern League Post-Season All-Star Team after batting .275 with 22 HR and 97 RBI ... Was also named to the Howe SportsData and USA Today All-Prospect Team ... Called up to Oakland on August 27 and went 0 for 5 in a start at shortstop that night against New York ... Picked up his first major league hit on the 28th with a third inning triple off Hideo Nomo in Los Angeles and belted his first home run on the 29th off the Dodgers Scott Radinsky ... The home run tied the game and he also had the go-ahead RBI single in the 10th inning of that game before Los Angeles scored two in the bottom of the 10th for the win ... Each of his two home runs with the A's tied the game ... Four of his 10 RBI either tied the game or put the A's ahead ... Started each of the A's first 24 games at shortstop after his recall but appeared in just two of the final six games ... Went 17 for 63 (.270) with 2 HR and 9 RBI over his first 15 games but then went 3 for his last 36 (.083), including a 0 for 22 skid, to finish the year at .202 ... Did hit .318 (7 for 22) with runners in scoring position ... with Huntsville, he appeared in 128 games, all at shortstop ... Was third on the club in home runs and stolen bases (15) and fourth in RBI and hits (138) ... Had a 13-game hitting streak in April. Was named to Baseball America's Class-A All-Star team, the California League post-season All-Star team and the Howe Sportsdata All-Star and All-Teenager teams...Was also named the top prospect and Most Exciting Player in the California League by Baseball America...Was hitting .291 with 18 HR and 65 RBI on July 19 when he broke his left thumb...Went on the Disabled List the next day and did not return until August 10. Spent his first season in the US at Class-A Southern Oregon and was the shortstop on the Northwest League All-Star team. Played for the A's affiliate in the Dominican Summer League, hitting .294...Tied for league lead with 18 HR and led A's with 62 RBI. Signed with the A's as a non-drafted free agent on July 17 at the age of 19 but did not play. April 4, 2015 Pericos de Puebla signed free agent 3B Miguel Tejada. December 5, 2014 SS Miguel Tejada assigned to Aguilas Cibaenas. August 9, 2014 Jacksonville Suns released 3B Miguel Tejada. June 8, 2014 Jacksonville Suns placed 3B Miguel Tejada on the 7-day disabled list. Right rotator cuff tendinopathy. May 31, 2014 sent SS Miguel Tejada on a rehab assignment to Jacksonville Suns. 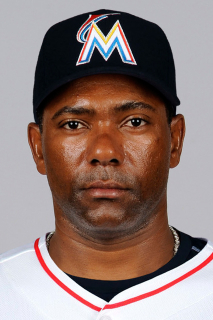 May 19, 2014 Miami Marlins signed free agent SS Miguel Tejada to a minor league contract. December 14, 2013 3B Miguel Tejada roster status changed by Aguilas Cibaenas. October 31, 2013 Kansas City Royals activated 2B Miguel Tejada from the restricted list. August 17, 2013 Kansas City Royals placed 2B Miguel Tejada on the restricted list. August 14, 2013 Kansas City Royals transferred 3B Miguel Tejada from the 15-day disabled list to the 60-day disabled list. Right calf injury. August 11, 2013 Kansas City Royals placed 3B Miguel Tejada on the 15-day disabled list. Strained right calf. March 31, 2013 Kansas City Royals selected the contract of 3B Miguel Tejada from Omaha Storm Chasers. March 30, 2013 Miguel Tejada assigned to Omaha Storm Chasers. February 1, 2013 SS Miguel Tejada assigned to Dominican Republic. December 31, 2012 Kansas City Royals signed free agent 3B Miguel Tejada to a minor league contract and invited him to spring training. June 25, 2012 Norfolk Tides released 3B Miguel Tejada. May 20, 2012 3B Miguel Tejada assigned to Norfolk Tides. May 8, 2012 Baltimore Orioles signed free agent 3B Miguel Tejada to a minor league contract. September 8, 2011 San Francisco Giants released 3B Miguel Tejada. August 31, 2011 San Francisco Giants designated 3B Miguel Tejada for assignment. August 16, 2011 San Francisco Giants activated 3B Miguel Tejada from the 15-day disabled list. July 19, 2011 San Francisco Giants placed 3B Miguel Tejada on the 15-day disabled list. Lower abdominal strain. December 2, 2010 San Francisco Giants signed free agent 3B Miguel Tejada. November 7, 2010 SS Miguel Tejada elected free agency. July 29, 2010 Baltimore Orioles Traded SS Miguel Tejada to San Diego Padres and San Antonio Missions Traded RHP Wynn Pelzer to Bowie Baysox. January 26, 2010 Baltimore Orioles signed free agent Miguel Tejada. November 6, 2009 SS Miguel Tejada elected free agency.